Los Angeles and Orange Counties combined have over 100 miles of coastline, so going to the beach is one of the most popular free things to do in LA and one of the Top Los Angeles attractions overall. The beach is a great place to beat the heat on a summer day or warm up in winter, but what you can do at each beach varies. Each has a different personality, with some being better for specific activities than others. Here are some popular things to do at the beach, and some of the best beaches to do them. Although some activities are easier to access in summer, most can be arranged year-round. If you're looking for a beach by beach list of amenities, check guides guides to LA Beaches and Long Beach Beaches. If you're planning ahead, you can check the average LA beach temperatures by month. You can lie on the sand at any Southern California Beach, but some beaches have chair and umbrella rentals and other beach services. Santa Monica, Venice and Huntington Beach have vendors offering beach butler service including chairs, umbrellas, float toys, towels and refreshments available. Long Beach has chair and umbrella rental. The availability of beach chairs and equipment varies depending on the season and the weather, usually available daily during summer but only on warmer weekends in winter. Not every beach is created equal when it comes to swimming in the ocean. Heal the Bay regularly reports on water quality at Southern California beaches. Generally, the beaches with smaller waves, like Long Beach, also have dirtier water, but their grades have improved greatly since controls were put on the LA River. If you're deciding on a beach based on your desire to swim, check the wave conditions on Surfline.com in addition to water quality. West-facing and south-facing beaches often have different conditions. If you want to swim near the ocean, but not IN the ocean, Santa Monica, Long Beach, Huntington Beach and Laguna Beach have hotel pools with ocean views, or you can visit the community pool at the Annenberg Beach House in Santa Monica. The character of a walk at the beach can be very different from beach to beach. Most LA area beaches have a paved bike path with a walking lane, so you can walk or run at the beach without actually walking in sand. Beyond that, there's differing scenery. Zuma and Bolsa Chica have great expanses of nothing but sand with no other landscape or architecture in view. Santa Monica Beach and Long Beach beaches have an urban backdrop. Venice Beach has its quirky boardwalk. Redondo Beach, most Malibu beaches, and Laguna Beach in Orange County, are the most scenic, with rugged cliffs and rock outcroppings. If you don't have your own bike or skates with you, they can be rented, along with pedal surreys and pedal karts for use on the beach bike paths. Rental locations are available in Redondo Beach, Santa Monica, Venice, Hermosa Beach, Manhattan Beach, Huntington Beach, Newport Beach and Laguna Beach. For watching the greatest eccentric diversity of the world pass by, you can't beat Venice Beach. Santa Monica is one of the most popular and crowded beaches, so you'll find a diversity of humanity there as well. 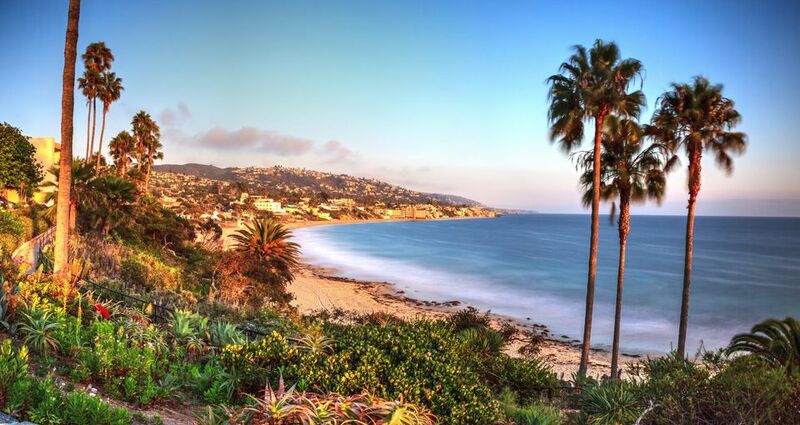 For the most beautiful people watching, Malibu and Newport Beach are better targets. You can get a good beach workout at any beach with a little creativity, but some beaches are actually equipped with exercise equipment for adults and playgrounds for kids. Most major beaches have volleyball courts - usually near the pier - that are available to the public when not in use by tournaments and team practices. Venice Beach has its famous Muscle Beach as well as a variety of exercise bars and rings and a children's playground. Santa Monica Beach has its own smaller Muscle Beach workout area. Long Beach and Huntington Beach have children's play areas and a smaller amount of beach exercise equipment. Only three LA and Orange County beaches allow fires and barbecuing on the beach and they have concrete fire pits for that purpose. They are Dockweiler State Beach in Playa del Rey near LAX, Cabrillo Beach in San Pedro and all of Huntington Beach, including Bolsa Chica State Beach. Beach bonfire areas can be super crowded on summer weekends, so if you want to claim a pit, you have to show up early. Dockweiler and Bolsa Chica also both have RV parking, which makes them popular for large groups and reunions. You will find surfers and boogie boarders up and down the coast at most Southland beaches with the notable exception of Long Beach beaches and San Pedro beaches, where the beaches are within the harbor breakwater. The most famous surf spots are in Huntington Beach, Malibu and Santa Monica as well as Hermosa Beach, Manhattan Beach and Redondo Beach. Local surfers can be very territorial, so if you're visiting it's best to check in at a local surf shop to find out where the best breaks are for visitors. If you take a surfing lesson, your instructor will guide you to an appropriate spot. Kitesurfing is gaining popularity in Southern California. One of the most popular beaches for kite surfing is Peninsula Beach at Belmont Shore in Long Beach, where you can also rent kitesurfing equipment and take lessons. The water is pretty flat inside the breakwater, making this the most recommended beach for beginning kite surfers. You'll also find kitesurfing lessons in Malibu. You will see kitesurfers at Cabrillo Beach, Seal Beach, Huntington Beach, and Redondo Beach, but those areas are only recommended for intermediate to advanced kiteboarders. You can also fly a regular kite on the beach since it's usually nice and breezy. The most popular spot for windsurfing in the LA area is Cabrillo Beach in San Pedro, home of Captain Kirk's Windsurfing School. You'll also find some windsurfers sharing space with the kitesurfers at Belmont Shore Beach in Long Beach. You can rent kayaks at the marinas in Marina del Rey, Redondo Beach and Shoreline Village in Long Beach, or from beach locations on the inland waterway beaches on the Long Beach Peninsula, at Huntington Harbor in Sunset Beach or at Newport Back Bay in Newport Beach. In addition to the activities listed above, you can rent jet-skis at the Shoreline Marina in Long Beach, which isn't technically at the beach. You can take a Segway Tour at several beaches. A Segway is a two-wheeled vehicle that you stand on to zip around on paved surfaces. Guided Segway tours are available at the beach in Santa Monica and Venice, Marina Del Rey, Long Beach and Newport Beach. Stand-up paddle-boarding and hydro-bikes are two growing beach activities in the LA and Orange County Area area.